In the hamlet called "Prariand", ideally located at the entrance of Megève, the prestigious chalet Mocka seduced by the tranquility of its environment and the beauty of the landscapes around. Its large terraces allow you to enjoy a 360 ° view of the Rochebrune, Mont d'Arbois and Mont Joux mountains with the mythical summit of Mont Blanc as a backdrop. With a living area of approx. 230sqm, the prestigious chalet Mocka offers three levels of warm and cozy living spaces: - on the ground floor: the entrance opens onto a small apartment of 2 bedrooms with bathrooms / WC, a kitchenette open to the living room which gives access to the garden of the chalet. On this same floor: a garage, a cellar, a guest toilet, a laundry room and the boiler room. - on the first floor: you enjoy large and comfortable living spaces. The large lounge welcomes your relaxation moments near the stone fireplace and offers you the luxury of the Mont Blanc view. The TV corner allows you to rest in peace. The large corner balcony and the terrace are accessible through the bay-windows that open onto a panorama of mountains whose colors change throughout the year. The fully equipped open kitchen opens onto the dining room and rustic table surrounded by benches. The desk and the mezzanine complete this living space. - on the second floor everything is comfort and cozy atmosphere. The master en suite bedroom is spacious and enjoys a balcony on Mont Blanc. The second bedroom en suite also faces the sleeping alcove as a cozy refuge for children. Outbuildings: Garage 2 places, private garden. 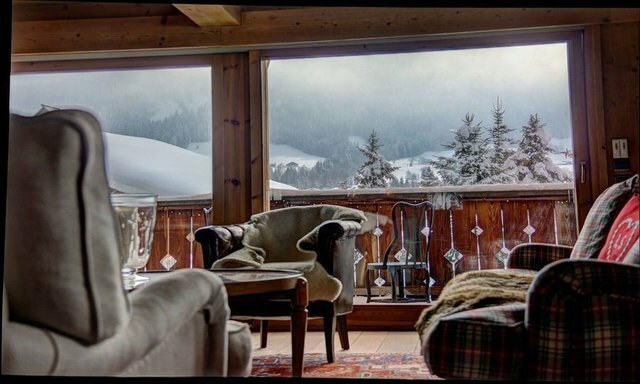 Exposure: South, South / West The highlights of this prestigious chalet: - the quiet location at the entrance to Megève - the view over Mont Blanc and the Mont d'Arbois, Côte 2000 and Rochebrune mountains - the warm and cozy atmosphere of this beautiful wooden chalet. Propriétés de Megève Megève Sotheby's International Realty, expert in the sale of luxury chalets in Megève.